I CAN MAKE MY OWN PASTA! 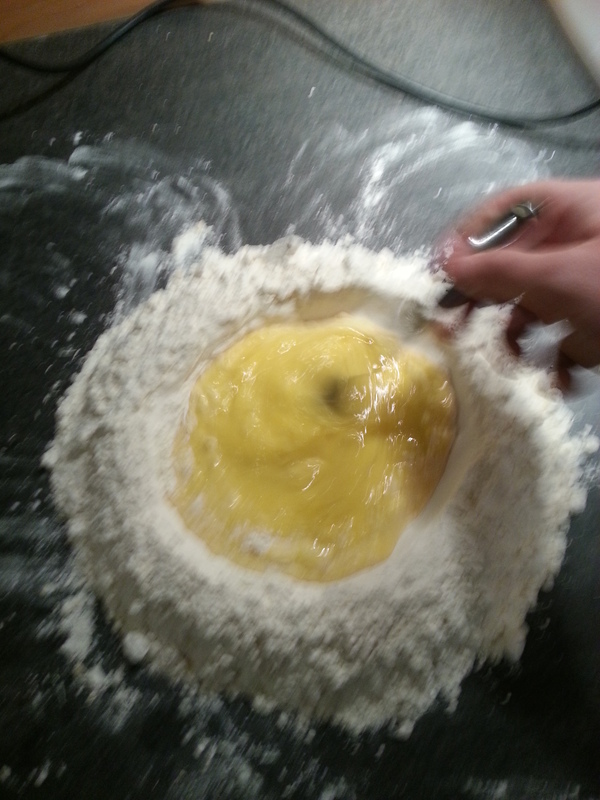 11 Comments on I CAN MAKE MY OWN PASTA! 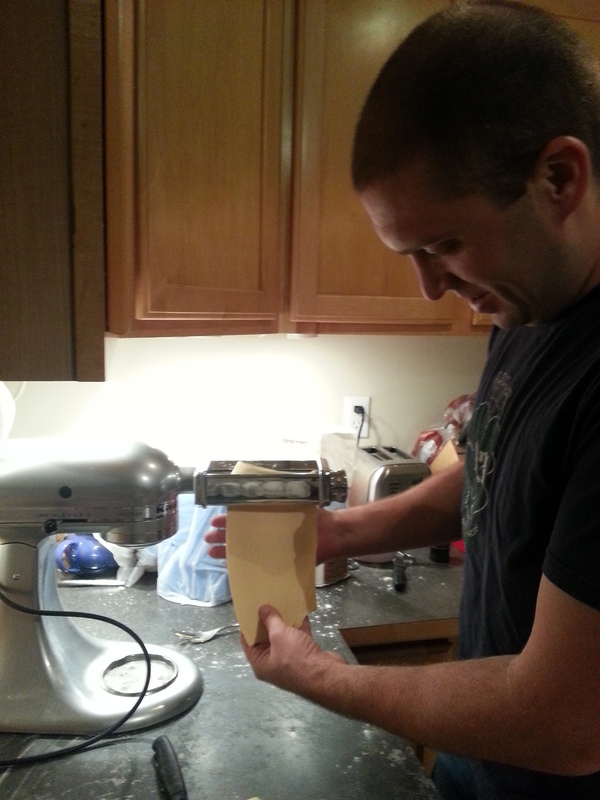 That’s right folks… the winning Christmas present this year was the pasta maker attachment for our kitchen-aid. I – of course – am an enormous fan of pasta (not that I am enormous, that’s just in reference to the magnitude of my affinity for the foodstuff), and I tried outa batch the first chance I got. The first batch ended in disaster. I mixed the appropriate ingredients in the mix-master, as the instructions prescribed, and the result was a grainy mess that – try as I might – simply would not come together into the “velvety” lump of dough promised in the booklet. It looked more like regurgitated corn muffins. Needless to say, I was doing something wrong (using a machine). My second attempt was much more successful. I used the time-tested tradition of mixing the dough right on the countertop in a well hollowed into the flour. I added the other ingredients – the eggs, water and flour – into the well, and scrambled it together with a fork. 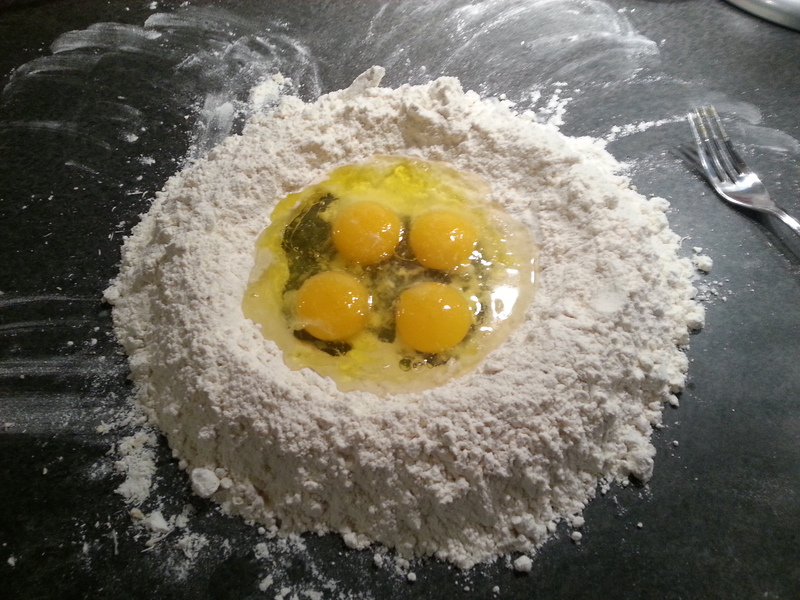 While scrambling, the egg slowly absorbed the flour into the mix, and after a certain point, it was viscous enough that I was able to drop the fork and dive in with my hands, folding the remaining flour into the mix. What followed was a 15 minute process of mixing, folding and kneading the dough to that velvety consistency promised by the kitchen aid booklet, after which I allowed the dough to rest, wrapped in plastic wrap, for about 25 minutes. 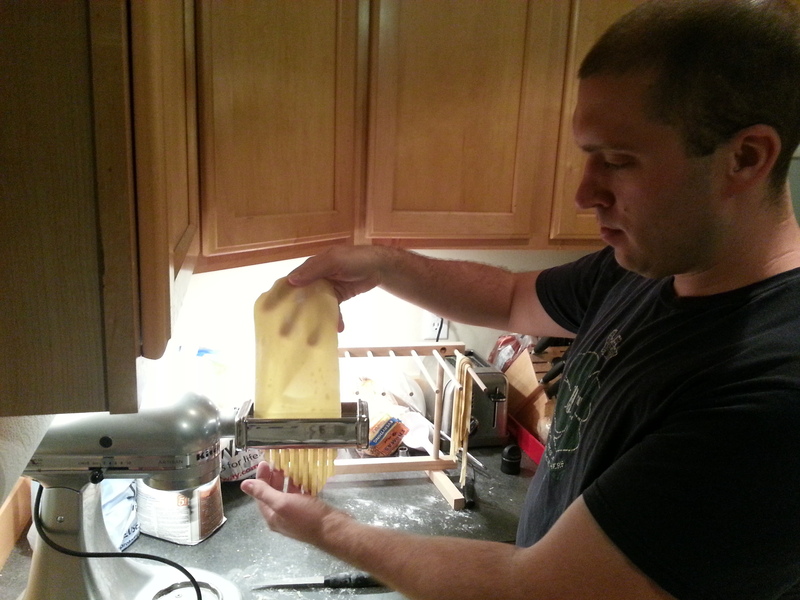 I then cut the dough into six sections and followed the directions provided for the pasta roller. First I rolled it flat, to a medium thickness, by feeding it through, folding it square, feeding it through again, and repeating the process until the texture was consistent. 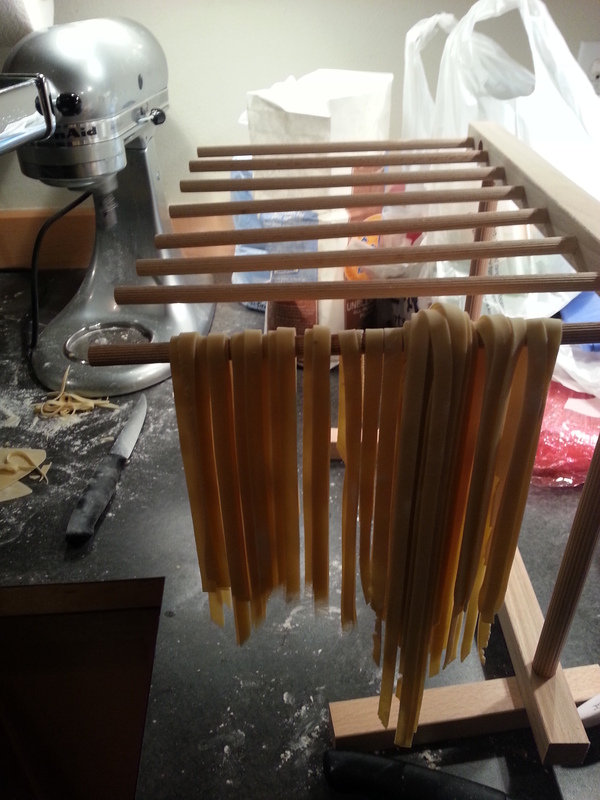 Then I cut it into linguine, and hung it to dry on my brand new pasta rack! I hope so, honey… I hope so. Eeep! I got one too! I’m so excited to try it. Hand rolling out raviolis was Ridiculous. May you make many wonderful pasta creations! Many thanks, and congratulations on the wonderful gift! Wow! I am so impressed. I have never made my own pasta, but I do know that it makes an incredible difference! Looks like fun too! Try it! It makes all the difference! Previous Entry Liquid Xmas Present!